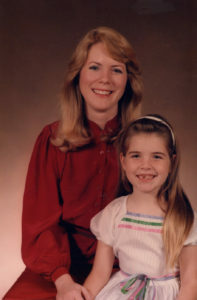 Last year, I wrote about my mother. It’s strange how things you don’t expect surface through writing. If you’re interested, go take a look. This year, however, I want to write about being a mom. Maybe we’ll both learn something unexpected. So here it goes. I’ve never been particularly maternal. As a young teenager, I decided after my first babysitting job that I wasn’t going to do that again. Instead, I went out and got a job waiting tables so no one could rope me into watching kids for spending money. Also, I never planned to have children of my own. (Okay, I was a teenager, and the more my family rolled their eyes when I made this claim, the more stubborn about “no kids for me” I became.) But, I pretty much kept saying and believing it well into my twenties. I was twenty-six and had been married about six years when I got pregnant. It wasn’t planned, but then, sometimes the best things that happen aren’t. The most vivid memory I have, however, is from the day I brought my infant daughter home from the hospital. I put her in her crib, and for a moment, stood watching her sleep. It struck me in that moment, so strongly that I can still remembers the panic that rose up, tightening in my chest. I never wanted to love someone that much. Yes, after years of not wanting a child, I was now more vulnerable than I’d ever been in my life— simple because of the strength of the love I felt for this tiny creature. Looking back, I think a part of me knew that I would love her like this, and maybe I didn’t want to be that defenseless. Andrea with her oldest daughter, Morgan. My daughter is now all grown up with children of her own. Being her mom did not suddenly make me the most maternal or domestic woman on the planet. I didn’t bake cookies or host kiddie tea parties. 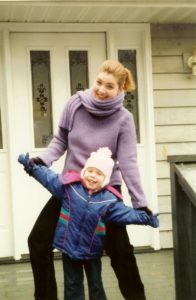 I was a working mom, with all that entailed, and I loved it. Having a child, however, change me in one significant way. I am totally at my daughter’s mercy. Still. Considering the above, let’s shift gears a bit. For those of you who’ve read my books, I’m guessing my revelations is surprising. A majority of my books are populated by children. Even my thrillers revolve around kids. Why? Well, I posted a bit about that when talking about my A Mother’s Heart series. (Why A Mother’s Heart) Other than what I say there, however, I’ve yet to figure it out. So, Happy Mother’s Day to all the moms out there, and please, feel free to share your “mom” stories in the comment section. This entry was posted in Holidays, Memories. Bookmark the permalink.